A few weeks ago we discussed using your iPhone to shoot video using a Steadicam. 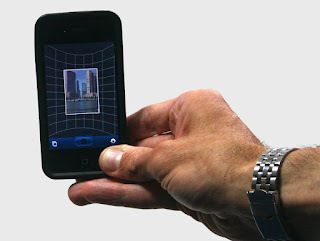 Today we'll be talking about another use for your Apple iPhone (or iPod Touch) - building panoramas. For me, creating photographic panoramas has always been a passion, now I can do it using only an iPhone. Okay, this may not necessarily be DV, but it is digital imaging that could be used in a video project, so I'm giving myself permission to digress from the DV theme for a moment. Although a DSLR and Adobe® Photoshop® are still my preferred tools for creating panoramas (we'll talk about the process of creating a panorama in Photoshop in a future blog), I found an application (app) that allows me to shoot and stitch my photos on an iPhone with just a couple of clicks. Actually three clicks to be exact: start, stop and save. Last summer, I had the opportunity to try out this cool tool while on a trip to Chicago. I was creating panoramic photos immediately after installing it. The app is called 360 Panorama by Occipital and it’s incredibly easy to use. The interface even includes a wireframe grid to help you keep the iPhone aligned as you’re shooting your panorama. Once you click the start/stop button, all you have to do is pan the iPhone and each part of the panorama is captured and aligned with what has already been captured. When you’re done, click the start/stop button – the image is processed in a couple of seconds and then it’s ready to be saved. You can even upload the finished image to your Twitter and Facebook accounts without even leaving the app. Although I haven’t used them, I’ve also heard about other apps that use the video camera of the iPhone and create panoramas from that. I’d be interested to hear if anyone has had any experience using that type of app. There are a lot of utilities for the iPhone and a lot of them are available as free downloads. As I stumble across ones I like, I will continue to post reports here. It's gotten to the point where I no longer miss having a laptop with me while I’m on the road. Cool App Jamie, There's another one called TourWrist that allows for sharing them. Thanks Mike, I'll have to check it out. Share Panorama™ with you. It is another panorama app worthy a try. Please check it out.